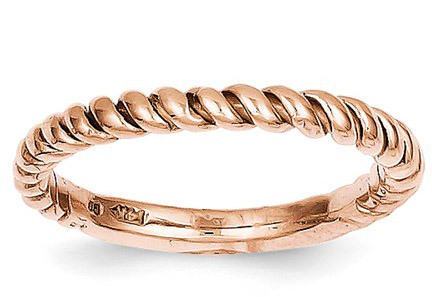 A polished 14k solid rose gold band with twist design for women. Available in sizes 5-9, including half sizes. Can we born as a rose gold wedding band or stand-alone rose gold ring. Unlike much jewelry today, this band is made right here in the U.S.A.! We guarantee our 14K Rose Gold Twist Band to be high quality, authentic jewelry, as described above.